Thank you so much for the beautiful instagram comments on the birth of our little Forest Sage we read every one of the comments and feel truly blessed to have such amazing love and support shown to us. This is my first of 12 weeks of Postpartum Vlogs. Today I’ll do 4 videos, 3 on the birth and the last one on the past week. Definitely sleeping through these knarly post birth cramps (or I should say not sleeping through them!) Guys! Does everyone else know what I mean by these? I’m talking cramps that feel like early/mid labor contractions. Especially when Forest is nursing, they got so intense I would have to breathe through them and rock my hips like I was laboring again. Day 2 & 3 were the worst, they came around every 10-15 mins and were pretty crippling. I didn’t have this with Bodhi, but they say with every subsequent child they get worse. Thankfully after day 4 they subsided! EVERYTHING! I just have had the happiest week of my entire life. I waited for the hormonal dip and to start feeling low but I’ve been on such a post birth high. I think it’s a combination of things. Firstly my birth was one I feel really happy about, it was healing and lovely and truly my dream birth experience. My husband also isn’t working so I have his amazing and incredibly hands on support, then just being here in Adelaide with no real commitments accept for getting ready for Christmas means it’s been very relaxing! My mum lives on our property here too so she has been helping do washing and snuggling with baby while I take a nap every second day or so. Lastly, I just have really used this week to meditate on how lucky I am to have healthy children. It makes me overwhelmed with emotion and gratitude. I read a journal entry I wrote earlier in the year expressing my fear of not being able to have another child and then that next month we conceived, it really put things in to perspective. So it’s been a very reflective and thoughtful week for me. Also BODHI oh wow I’m completely blown away by his love for his brother. I have video after video of him holding Forest (he asks every ten minutes and no one else can touch Forest when he is holding him!) 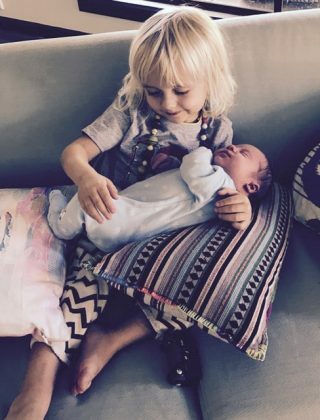 Bodhi sings whispered songs to him that he makes up “youuuure my broooother and I won’t let aaanything happen to youuuu” he pats his face and kisses him and says “don’t worry I’m here” calls Forest “my baby, my sweet baby don’t cry”. I cried last night at how thankful I am that he has transitioned so beautifully. I also cried that Bodhi seems so big now and that he is such a brave, courageous and beautiful little man to set aside any confused or sad feelings about not having Mama/Dada to himself and instead has just led with excitement, curiosity, love and protection of Forest. I never thought it was possible to love him any more than I do but my heart has grown even deeper and it’s met with such an admiration for Bodhi. None really to be honest! Apart from a daily bath, which Bodhi usually tries to interrupt at some point after 5 minutes. Even my nap I take with either Forest or Bodhi so it’s dictated by their sleeping schedules. I still put B to sleep and of course Forest to sleep at nighttime so Mark and I aren’t really having couple time either, but we are just so enjoying these magical sleepy days staring at our boys with such love and a kind of disbelief. At least we have each other to navigate the long nights, it’s so lovely to share this period with Mark. Right now it’s just a go with the flow attitude! Forest didn’t want to sleep in his co-sleeper so now he is just bed sharing with us using safe co-sleeping principles. I had a plan to use the Bednest but Forest had other ideas. So by night 4 I figured out which position to sleep in to be able to easily breastfeed and then to not wake him up when I shifted back in to position to sleep myself. Night 1 we had NO sleep at all, Mark and I just stared at Forest making sure he was okay, night 2 we slept a little better, night 3 it was another sleepless night and nights 4-6 have been better since now Forest will feed for 20 mins and then sleep for 2 hour stretches. Bodhi sleeps from 8-6:30am so Mark has been getting up with him since Forest doesn’t wake until 8:30am, it means I’m getting a little sleep in! So the sleeping has been sporadic, it’s definitely been zombieville in our house but we are enjoying it. I assume in the coming week or so when body clocks are reworked then we might start to be able to have not only time for each other but time for ourselves. The key this week has been making very loose daily plans that we can break if we are too tired! Tons! Banana bread from our fav Adelaide Hills spot Harvest, zucchini pasta, pancakes, flat bread and cacao smoothies from our new fav 100% Organic Adelaide spot Natures Providore, green juices, grilled tomato and olive focaccia’s and heirloom tomato salads. I also indulged and had hot chips and donuts at the Lobethal Lights! Has felt amazing this second time round. The healing has been fantastic. With Bodhi I had a small abrasion that was very painful but I had no post birth cramps. This time the cramps have sucked but I’ll take them over the first birth healing process any day. This week nights 1-3 I was really struggling with the cramps during nursing, I also had post birth night sweats for the first few nights too. I’ve had very little bleeding this time round and I’m not sore. I’m actually in shock at how good I feel, perhaps for me it was the difference between birthing in the water versus birthing out of the water. I’m not sure, all I know is that it’s been a lot easier. My stomach is very deflated and soft but it has come right back in, I think because of the intense cramping. I also have been wearing the Belly Bandit daily which has helped support my very smooshy stomach. I’ll slowly start work on building my core back up about 6 weeks post birth. My breasts have also doubled in size as my milk has come in. I just want to mention that I’ve decided to not talk about post baby weight loss because of a few reasons. Firstly I think there is already an unfair pressure on Mothers to lose baby weight whether it’s self imposed pressure or societal pressure, I think it’s something that really shouldn’t be focused on as we embark on connecting with our babies. Secondly, every woman’s body is completely different and will hold on to weight or lose weight at very different rates so drawing a state of comparison with someone isn’t going to serve us in anyway. The same way every baby and every birth is different so too are our bodies. What we can focus on however is HEALTH and health isn’t dictated by a number on a scale. By health I mean making smart food and exercise choices to best support our bodies as we nurture our babies. Choosing whole food based nutrition and moving our bodies helps support nourishment of ourselves, our families and perhaps most importantly our minds. It’s more important how we feel and how we cultivate self love and acceptance as opposed to getting down about losing baby weight. We must be gentle with ourselves and remember how miraculous bringing a life in to the world is and how phenomenal our bodies are for having birthed these babies however they’ve decided to come earth side. This has been the most special week of my life. Its hard to put in to words exactly why, however I certainly know that I feel complete right here where we are. The love I have for my little tribe is absolutely overwhelming, it’s the calmest and most certain I’ve felt in years. I remember feeling so elated after Bodhi was born, so in love and emotional. I’m having all of those feelings now but with all three of my guys. I am so madly in love with Mark and the way he is with our sweet newborn and how he has been with Bodhi this past week. I think it’s so easy to take your partner for granted in marriage, you can become desensitized and stop really seeing each other. It’s such a natural part of ‘doing life’. With the birth of Forest it’s like suddenly I have come in to so much clarity and I’m feeling very very grateful for our partnership. So much has become clearer this week, I feel so connected, peaceful and present. Mainly thankful though to have these healthy boys and a supportive partner. I also honor the mothers out there who are having a challenging time with a newborn or older children, through pregnancy, trying to conceive or in marriage in general. I’ve been there too many times over and its truly about just riding the waves with patience and an open mind.